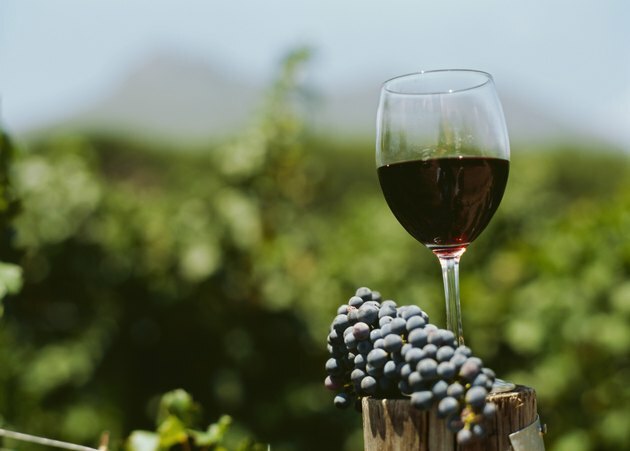 Red wine is a double-edged sword in the world of health and wellness: it may help reduce the risk of disease, however alcohol in general has been shown to negatively impact overall health status. The skins and seeds of red grapes contain antioxidants -- flavonoids and reservatol -- that may help reduce bad LDL cholesterol levels, increase good HDL cholesterol levels, prevent cancerous tumors and improve the health of neurons. However, alcohol can cause health conditions such as increased triglycerides, liver disease and stroke. More research needs to be conducted to determine whether the health benefits of red wine outweigh the health risks associated with alcohol consumption. In general, the sweeter the red wine, the lower the flavonoid content, so dry reds may be the best bet for health benefits. Cabernet sauvignon is extremely dry and has an aroma of black currant or black cherry, though it can develop hints of other flavors, including violet, ginger, vanilla or cedar. Cabernet may have the most potential health benefits of all the red wines, due to its flavonoid content. Research conducted at the University of California determined that, of all red wine varieties, cabernet has the highest level of flavonoids. Pinot noir is a rich, full-bodied, dry red, usually with flavors of black cherry but may also include hints of cinnamon, mint, green tea, vanilla or leather. The grapes it is made from are thick-skinned and the cool climates where the grapes are grown require them to produce high reservatol levels to survive. Pinot noir falls just behind cabernet sauvignon in its content of heart-healthy flavonoids. Pinot noir falls just behind cabernet in its flavonoid content. An ancient variety of red wine, syrah was originally produced in France. Other countries, such as Australia, South Africa and the United States pride themselves on their production of this dark red wine. The flavor of syrah is dry, heavy and spicy. Like pinot noir, syrah falls just behind cabernet sauvignon in its content of heart-healthy flavonoids. Before considering red wine consumption for health, it’s important to consult your doctor. The American Heart Association cautions against drinking red wine as a health practice, given the potential health risks of alcohol. Moderate daily intake of wine is two drinks for men and one per day for women. One drink is 5 oz. or 44 ml.